Song for a Whale is a cute middle grade novel about passion and community. If you’re a whale nerd like me, you’ll love this book. 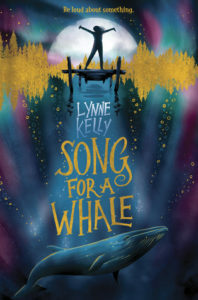 Song for a Whale is an adorable middle grade about Iris, a deaf girl, her family, and a whale. The author’s experience as a sign language interpreter lends authenticity to the narrative. I can’t speak to the deaf representation in the book, but Iris struggles not only with her dad who doesn’t know sign language well, a classmate who thinks they can sign, and her feelings of isolation. Even though Iris has her best friend, a grandmother, and her ability to fix radios, she still feels isolated in many ways. Her passion for Blue 55, in many ways, mirrors her own struggle for being heard, and feelings of loneliness. So it’s not a surprise that there’s some parallels between Iris and Blue 55. Throughout the book, these similarities are only deepened. In Song for a Whale we also read a few chapters from the whale’s perspective. While one of my only hang ups is that we put our own feelings on to the animals – assume that the whale is lonely, I really like how Iris connected to Blue 55. I imagine that a story like Blue 55’s would have impacted me growing up as well. Iris feels isolated from her grandmother after the death of her grandfather. Her father and Iris have trouble communicating. And a girl at her school is convinced she can sign, but won’t recognize how self-serving or wrong she is. So her journey with the whale mirrors the way she too is calling out into the distance, hoping someone will hear her. At the same time, Iris is a person who likes to fix things, and you have to wonder if she’s trying to track the whale down for herself, or for the whale. Song for a Whale is a story about finding our own courage to travel to new waters, meet new friends, and to deal with our own loneliness. It’s a story about inspiration, family, and new journeys. Find Song for a Whale on Goodreads, Amazon, Indiebound & The Book Depository. Horses and frogs are my favorite animals. Oh I always loved the idea of horses, but they intimidate me! Ohh I can’t wait to hear what you think of it! ooh that makes top five animals for me! It’s such a cute one and it’s got a pearly sheen to it too!